Summon Help - Press the Personal Help Button. Professional Intervention - The Base unit connects to the Customer Care Center. Personal Response - Within seconds a Personal Care Attendant will answer and assist you. Medical Alarm Systems are also known as Personal Emergency Response Systems or Medical Alert Systems. 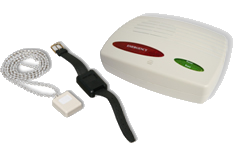 A Medical Alarm System has two working parts a Base Unit and a Wireless Transmitter (Personal Help Button). AGB Lifesaver Medical Alarms provides an easy to use Monitored Medical Alert System also known as a Personal Emergency Response System (PERS) that works simply by pressing a button. For seniors living alone, AGB Lifesaver Medical Alarm service provides you with the confidence that allows you to live in your own home with greater safety, security and peace of mind. In the event of a fall at home, accident or emergency, simply by pressing your personal help button you will be connected to our five diamond monitoring center and trained personal care attendants, who will send the help you need. Our medical alert system is your connection to emergency help or reassurance, 24 hours a day, 7 days a week, every day of the year! AGB Lifesaver Medical Alarm service provides seniors who live alone or have a disability or who have a chronic illness a 24 hour connection to help, whenever it may be needed. AGB Lifesaver Medical Alarms is proud to provide in home installation of Medical Alert Systems to individual clients and families throughout most of Massachusetts, New Hampshire, and Maine. We guarantee our rate to be the lowest installed rate in Massachusetts, New Hampshire and Maine. We also offer online sales throughout the United States and provide medical alert service on a national basis throughout the United States, call us for details. AGB Lifesaver Medical Alarms also provides medical alarm service through Eldercare Service Organizations, Senior Care Agencies, and Assisted Living Facilities.